Want to align your teeth without having to look unsightly with braces? If you’ve been searching the net for “alternatives to braces”, then we’re guessing that you’ve stumbled upon the word Invisalign. Invisalign is a series of clear and detachable teeth aligners that are proven alternatives to the conventional metal braces. Their purpose is nearly identical to Though Invisalign is widely regarded by most patients who have undergone it as a guilt-free way of aligning teeth without the unsightly look metal braces give, it still has its disadvantages – the gripping power of Invisalign makes it longer for the teeth to correctly align, and in some cases having no profound effect at all. A patient’s eating habits are taken into consideration, as well as the commitment to put on aligners at least 20-22 hours a day.Though brackets are known to cause pain, the profound pull force and corrective effect they give is still unmatched to this day. Patients with braces are expected to have their teeth corrected in usually less than two years’ time. Two years is a relatively short period if the degree of teeth protrusion can only be corrected by wire and bracket braces. However, recent studies have shown that new Invisalign aligners do a faster job in correcting/aligning teeth. Faster in a sense that it only takes half the time usual braces take to correct to protruding/misaligned teeth. But not be cut short of positive reviews, new brace systems are proven to be faster than Invisalign. These new types of braces, however, require complimentary surgery/implants to be done on the jaw, to further accelerate the alignment process. And still, the renowned comfort given by Invisalign aligners gives them mostly favorable responses from middle-aged people and adolescents as well. Unlike traditional wire and bracket braces, Invisalign not conceals the corrective aligners; Invisalign also makes it easier to clean the teeth because of detachability, lessening tooth decay usually caused by metal brackets, since the latter cannot be removed. Users of Invisalign seldom compare of casual tooth pain that traditional brackets have been known to give after every routine adjustment. Pain caused by Invisalign is very minimal and gradually fades off after approximately six weeks, wherein a new set of aligners are installed. The foremost advantage of Invisalign aligners (as emphasized by dentists) is that they can be detached before and after meals, to rid any clinging food nibbles from being stuck on the aligners. People with braces face the problem of bits of food being stuck on the wires after eating. This category makes Invisalign a clear winner. Whereas braces can align almost every kind of misaligned tooth, Invisalign is only limited to a select type of disfigurations. Round lower premolars are difficult for the Invisalign aligners to grip and rotate. 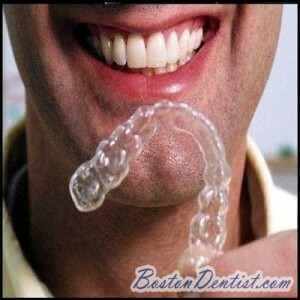 There is also looming concern on the durability of these types of aligners. A few cases of breakage have occurred while the patient has subconsciously been grinding teeth during sleep. Also taken into consideration is the materials used for Invisalign can trigger allergic reactions from the patient. But inasmuch as these toxicity reports have been taken into consideration, the FDA rectifies that instances of allergic attacks are extremely rare. Invisalign will eventually take the place of the traditional wire and bracket braces in the near future, but as for now, the cost of these aligners should be taken into consideration. Treatment prices are estimated to be $3,000 to $9000 for an average of 13-month treatments. Braces are not far from the price range, though. The accelerated alignment of teeth via aligners also calls for people to give Invisalign more patronage and consideration. © Copyright 1996 -2019. 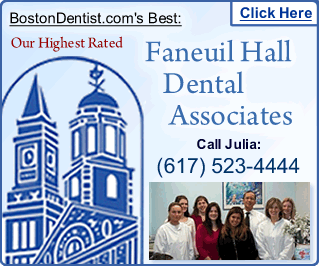 BostonDentist.com, All rights reserved.